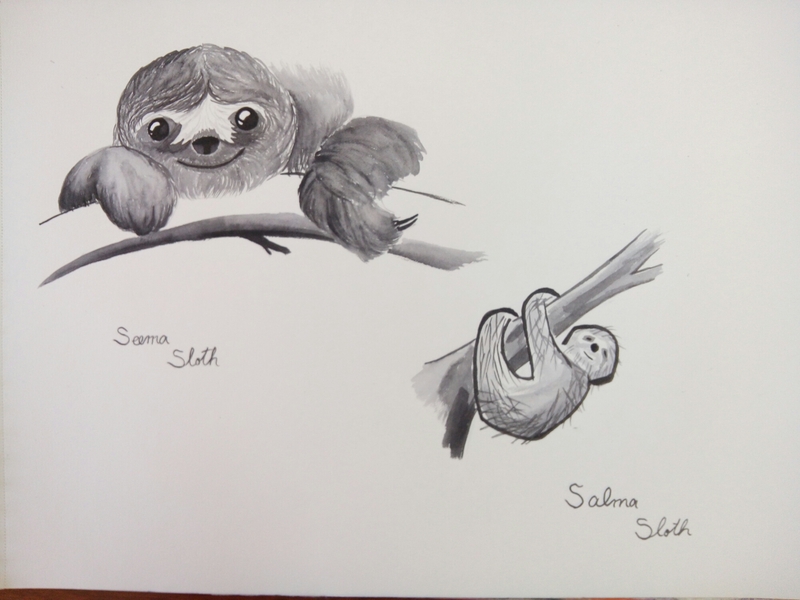 Seema Sloth, watches over her baby sister, Salma so her mother, Selina can have a session with her therapist, Salim. Seema loves baby-sitting, and helps her mother out often. Selina needs to visit Salim very often, as she sometimes sees things which no one else can and they frighten her. With Salim and Seema’s help, Selina is able to look after her baby, Salma, despite these frightening things she sees. 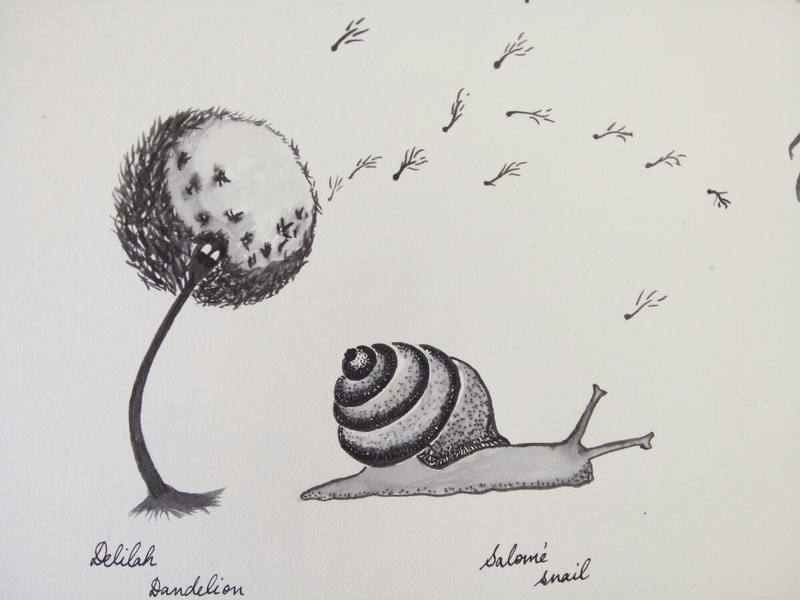 Delilah Dandelion and Salome Snail, are discussing the weather. Delilah is extremely good at predicting wind direction. And Salome is exquisitely sensitive to temperature. She senses it through her slime. Delilah and Salome have a plan to reclaim their part of the garden from the dead-wood structure the humans keep making the dog sleep in. The dog doesn’t like it there, and whines incessantly. And Salome and Delilah miss their comfy corner of the garden. Delilah wafts dandelion seeds when the wind is right, towards the dog-house. Salome oozes her way there and makes sure the seeds don’t scatter too far. Through their efforts, the dead-wood dog-house has slowly become overgrown with dandelion plants, which make the dog sneeze… so he spends very little time there. Slowly, their corner of the garden is becoming more like the familiar corner they knew before the humans cleared it and built the dead-wood dog-house there. Oliver and Wahida have been friends all their lives. Ever since Oliver got lost and floundered into the walrus colony carried by the north wind, with his pin-feathers all messed up, and Wahida calmed her fellow walruses so they didn’t stampede and smush Oliver, the two have been close. Oliver lives far away and in a warmer land, but flies north once or twice a year to visit his favorite walrus. Wahida is the uncontested matriarch of her herd, and uses several egg-men loyal to her (she has beat them in combat several times, thanks in part to her size – she’s strangely much larger than the male walruses in her herd – and enormous tusks, one of which is slightly bent) to assert her somewhat feudal authority over the herd. She and Oliver have a perpetual disagreement about effective and just forms of government. Oliver is a strong advocate of democracy and deeply critical of a rule established through force as he insists that power seized this way does not have the moral authority to make decisions for the group… though he is a little embarrassed by the kind of leadership a majority can usher in. Wahida is particularly vehement about resisting the demands of the majority when they are unfair to vulnerable members of the herd, like her brother Wasim, who lost a fin in the Orca attack which killed their father. Wasim and many others like him would not have survived if Wahida’s egg men hadn’t enforced her decision about the herd waiting for him while his wound healed and collected ‘taxes’ – a small portion of each herd-member’s catch used to supplement what Wasim and others like him were able to catch for themselves. The idea of ‘taxes’ was something Wahids borrowed from Oliver’s accounts of the Owl-democracy. Wahida and Oliver meet regularly and discuss their respective systems in a bid to try to make them better. Dakshayini Dragonfly is a very brave decoy water-dancer. She lives with a large group of female dragonflies, in their dry meadows, adjacent to a swampy wetland. Dragonflies from her group rarely venture to the adjacent territory which is occupied by a largely male dragonfly swarm, as they risk harassment in doing so. They only visit the wetlands when they feel like mating. Dakshayini’s job as the lead decoy water-dancer, is to skim the surface of the water, like a dragonfly about to lay her fertilized eggs, and thus distract the majority of the male dragonflies drawing them to the water, so her friends can find their way to the male dragonflies of their choosing, unaccosted by random male dragonflies. Dakshayini works with a team of eight other dragonflies, at their dangerous and tiring job. They are all exceptionally fast fliers, who train tirelessly everyday to improve their agility. Dakshayini is known to be the best at executing quick turns, at the last minute, just before a following male clasps hold of her. She trains young aspiring decoy water-dancers in her techniques twice a week. Hamida Humming-bird is one of the best hummers in her clan. Unlike other female humming-birds, she was hatched small and she learnt to fly with quick and agile movements much like the male hummingbirds. When she was young, the other girl-hummingbirds in her class used to tease her for being small and fast like the boy-hummingbirds. Hamida had a hard time fitting in… until she stopped trying. She entered a humming contest after school one day. None of the authorities thought to ask her her gender, as she looked small and flew quickly. She out-hummed Hazrat, three-time winner of the regional humming championship. Her wings beat far faster than his, her movements were quicker and more innovative. Her speed, agility and the new moves she tried made her hum fascinating and novel. It was only at the prize giving ceremony that her uncle (who had been participating as well) recognized her and let the organizers know she was a girl-bird. She was disqualified, and had to leave in disgrace. Hazrat who had been a good sport as long as he believed Hamida to be male, was angry and threatened her with all kinds of unspeakable harms… he felt that his male-ness had been challenged, now that he’d been out-hummed by a girl-bird. And indeed, after that day, Hazrat who had been popular with the largest and most ponderous of the female hummingbirds, began to be blown off on dates and had to seek nectar alone. Hamida had always been lonely, so she did not feel any different after the attention from her new humiliation dissipated. It was only when Hamida met Hema, a large, shy hummingbird, who had never really been impressed by the male-birds’ hums, and they became close that Hamida began to feel better about herself. Hema loved Hamida’s hum, and the two of them set up a nest together, despite the clan being most unhappy about it. Sometimes they were jeered at, with other birds asking what kind of a nest it would be without eggs. But Hamida and Hema were happy together and did their best to ignore the jeers. When Hanna Humming-bird was killed by a vicious cat, leaving no one to sit on her newly laid eggs, Hema volunteered to help. At first, Horace, Hanna’s partner, was reluctant to let Hema sit on them. 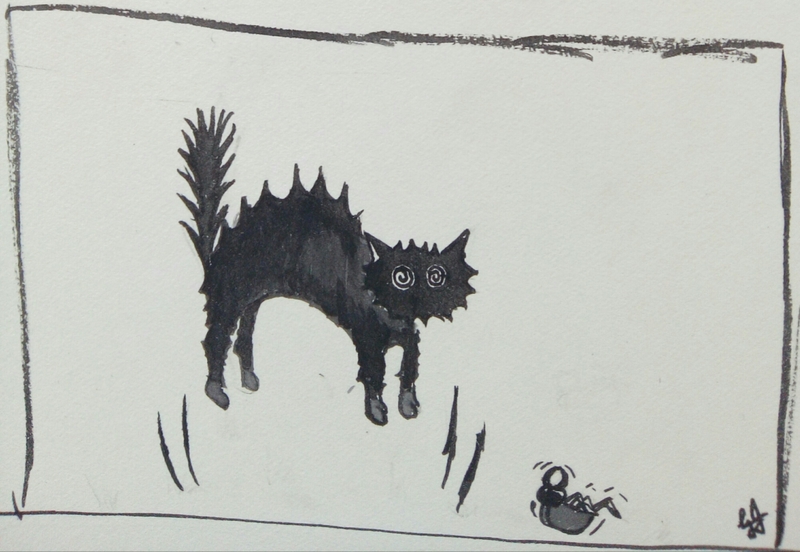 But he soon realised that the eggs would never hatch without Hema… and Hanna would never have wanted that. So he let Hema sit on the eggs. Hamida felt a little insecure about this, because she wondered if Hema resented that Hamida could not help her lay eggs herself. Hema was quite sensitive to this and reassured Hamida that she was quite happy to sit on Hanna’s eggs and would not exchange her nest with Hamida for anything in the world. When the eggs hatched, Horace was happy to have Hamida and Hema take care of the hatchlings along with him. The clan slowly got used to Hamida, Hema, Horace and the hatchlings. Apart from a snide remark here and there, their beautiful family is slowly being accepted. This is a small comic about my cat, Calvin. Though this behavior is probably true of many other scaredy-cats, I feel it’s particularly true of Calvin. Kabir and Kiruba are kittens from the same litter. Though their biological mother is Kala, they are lucky to be raised by the triad of Kala, Kali and Kasturi. Kabir is a fastidious kitten, always ready to deploy his charm on unsuspecting bystanders. Kiruba is a playful kitten, unfettered by kitty conventions of poise, grace and sleekness. Both Kabir and Kiruba are training in a different combat style, according to their natural inclinations. They are being trained by their mothers, until they are old enough to be apprenticed to the masters in their combat styles. These two are also in reparation for some of the days I missed when my family was visiting. Only two more backlogs to go, and I’ll be up-to-date with my inktobers. Yay! 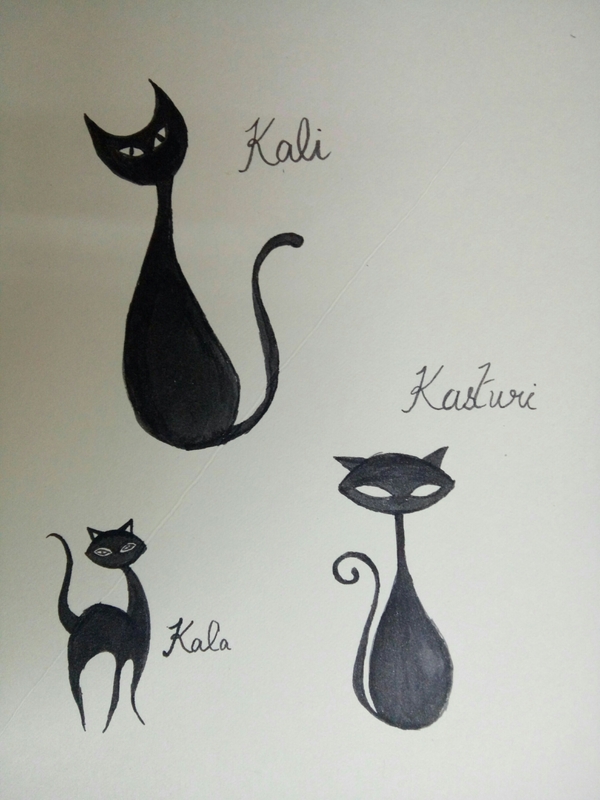 Kali, Kala and Kasturi are a team of elite Black Cats, trained in several kitty combat styles which have been scrupulously hidden from humans and passed down the generations from kitty to kitty. Kali, Kala and Kasturi also form a polyamorous triad. Together they guard their oblivious humans from a terrible fate. 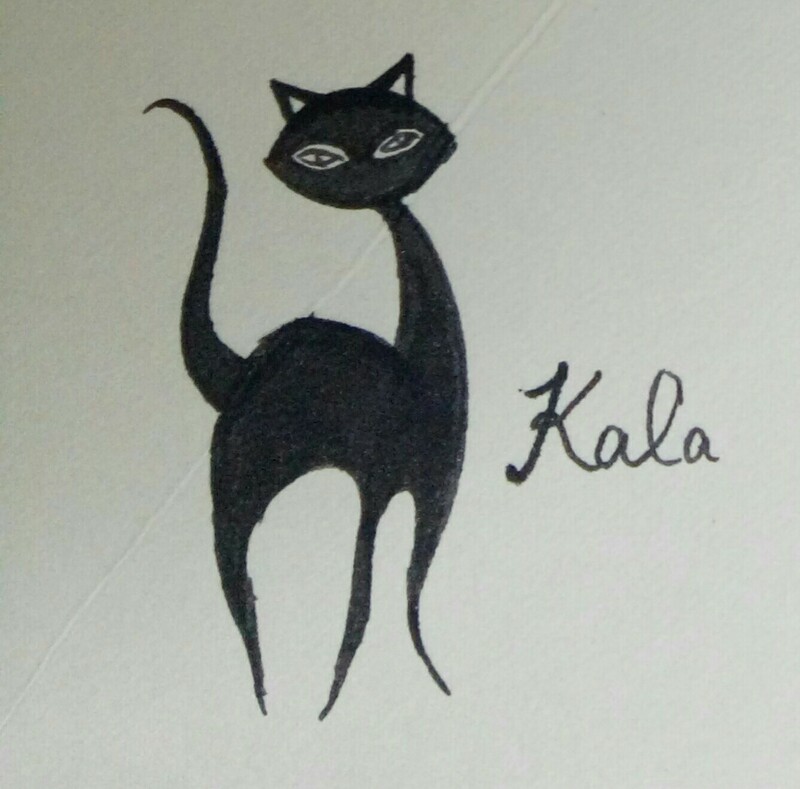 Their simple-minded humans often shake their heads bemusedly when Kala dashes across the house, in pursuit of the tentacled demons only she can see in the seventh dimension. To the humans, Kala appears to be fighting the air. They laugh at her behaviour and sometimes try to stop her. 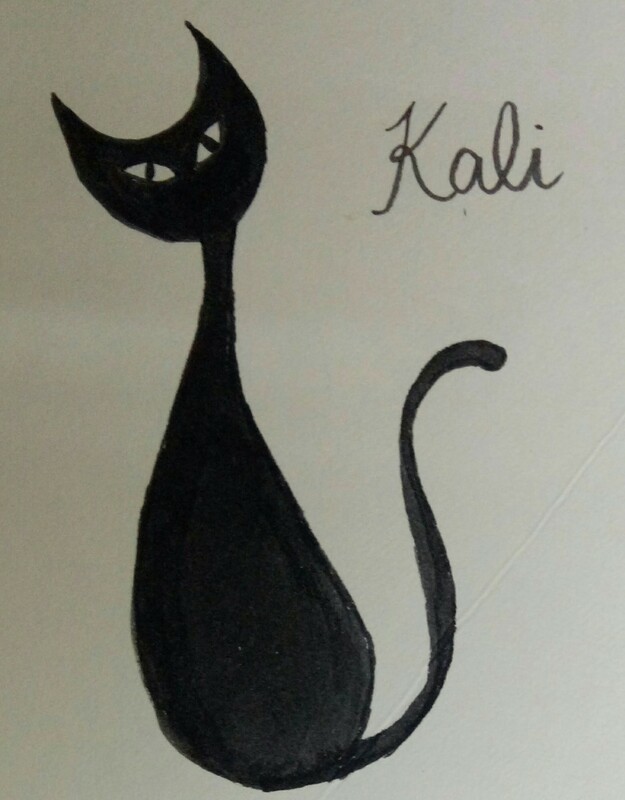 Kali is often met with irritation from their humans as she performs her sacred kitty chants at 3 am, to ward away powerful djinn who seek to eat their humans hearts. Kasturi’s frantic clawing at the couch and ritual spraying of the furniture earns her disdain and loud noises from the humans. They do not know that Kasturi’s claws and her mystic urine are all that protects them from the dreaded sofa monster that will drain their souls out through their bottoms if they remain seated in it for too long without Kasturi’s watchful presence. Together Kali, Kala and Kasturi keep the thankless humans safe from dreaded demons, monsters and djinn. They tolerate ear-scratches, undignified and inane baby-talk and belly rubs from the humans, as well. All in return for the human’s services as can-openers. 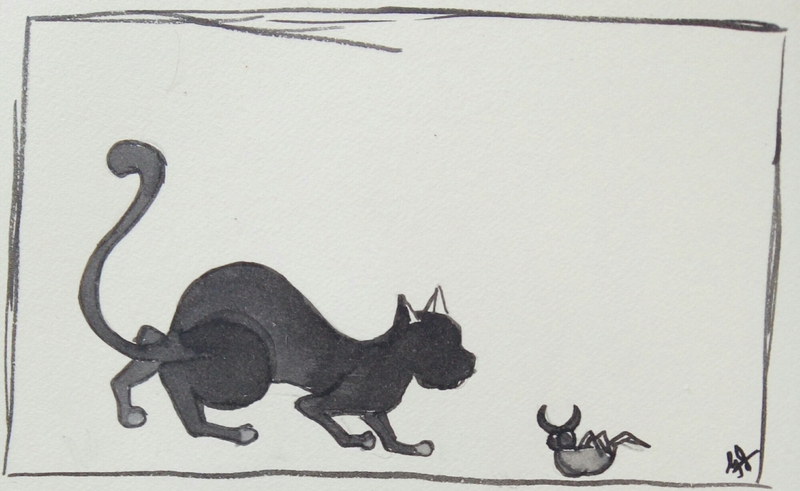 If only evolution had seen fit to bestow cats with opposable thumbs. The neck-scratches are worth it though. These three are to make up for three of the days I missed when my parents were visiting. I’ll make up for the other four by and by.